These pictures were taken at the 18th Annual Trans Am Nationals in Dayton, OH. The first picture is Corky Cordell's smooth 68. The second picture is Bob Trimpe's sweet 68 HO. 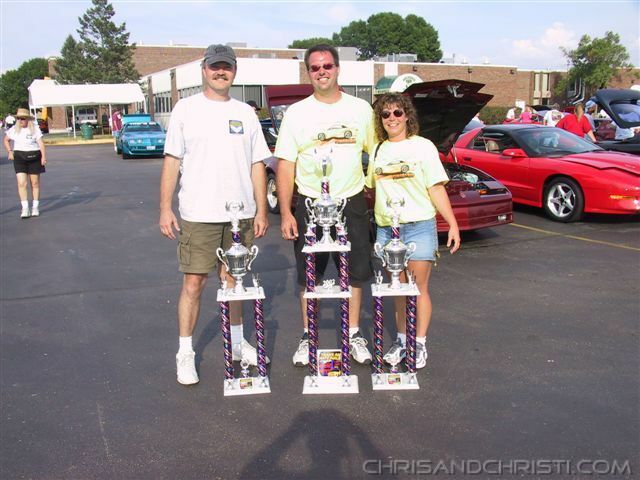 Bob picked up 5th in 67-81 Early Light Modified, and Chris and Christi won 1st place in 67-81 Heavy Custom and Best of Show with the 69.The third picture is Bob Trimpe, Chris Reynolds, and Christi Reynolds displaying their trophies after the show. Bob, Corky, and Chris are all part of the FirstGenFirebird list. This picture was taken at the 2003 MDA Car Show at the Roanoke Civic Center in Roanoke, VA. 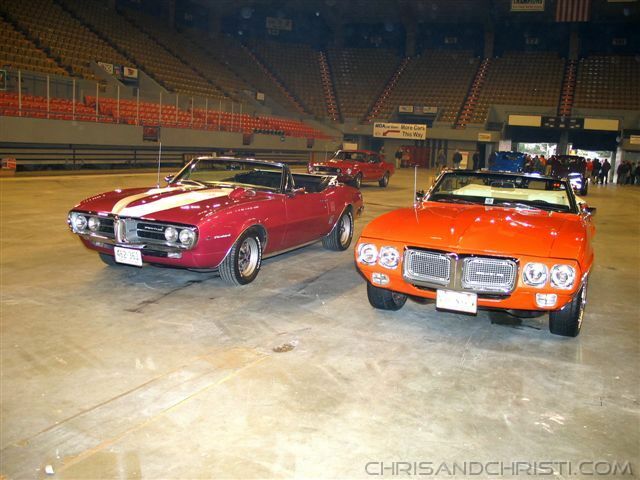 There were two first gen Firebirds at the show; our 69 convertible, and Cody Vincil's 67 convertible. Cody is also a part of the FirstGenFirebird list. This picture was taken at the 19th Annual Trans Am Nationals in Dayton, OH. 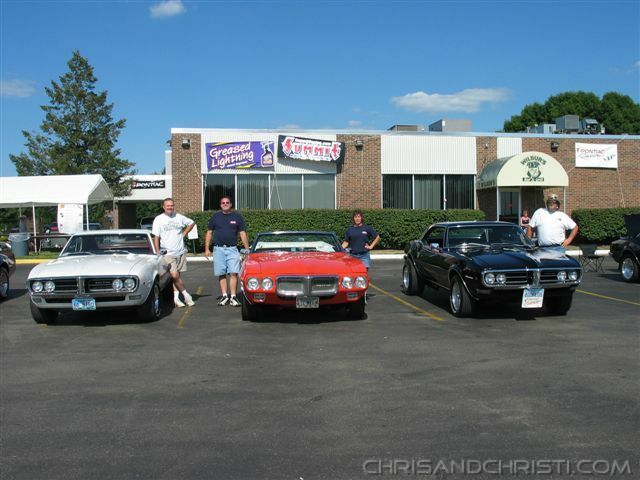 From left to right is Bob Trimpe and his 68 HO, Chris and Christi with the 69 vert, and Bill Parker with his 68, all FirstGenFirebird listers.. This picture was taken just before Chris demonstrated why the PCV valve should not be bypassed by creating a nifty smoke screen that 007 would have been proud of. 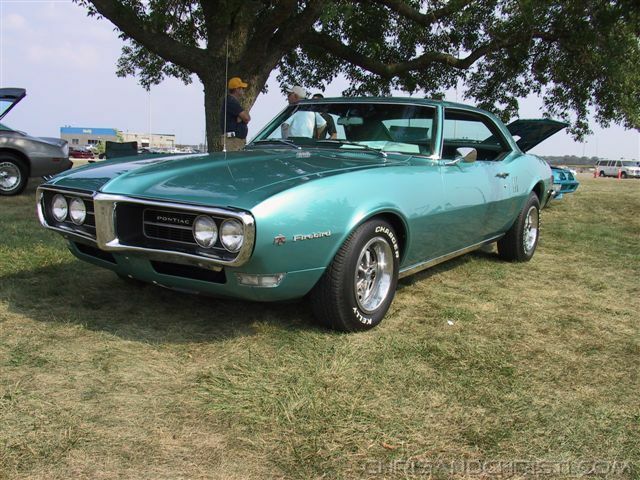 These were taken at the 21st Annual Trans Am Nationals in Dayton, OH. The top picture shows some of the many 69's at the show. The black convertible belongs to Don Hitchens who is a member of the FirstGenFirebird website. Corky Cordell is also a member, and owns the blue-green 68 in the bottom-left picture. Don Hitchens is a member with a 68 that's not complete, so he and his wife brought their 86 instead.